We can design any pole building that you want. 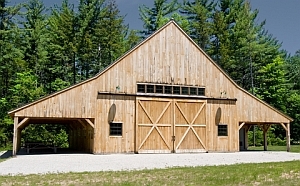 Please keep in mind that we are not suppliers or manufacturers of buildings, but we are engineers that design pole buildings (pole barns) to your exact specifications. After we design your building, we then send you the engineered construction drawings and you hire a contractor to build it, or you can build it yourself. The process of hiring us to engineer your pole building is one of the most affordable ways to get your pole building constructed. Prices vary throughout the United States based on several factors such as: the geographic location of the site; local building codes and regulations for your region, including snow, earthquake, and wind loads for your region, and other factors. Typical turn-around times can vary between 5 to 15 business days from when you place your order, depending on your requirements. We also have a rush service available for those needing a building expedited as quickly as possible. To start your pole barn design cost estimate request, please fill out the information below then click the button to continue to proceed to step 2. You may also call us at 877-736-7321.